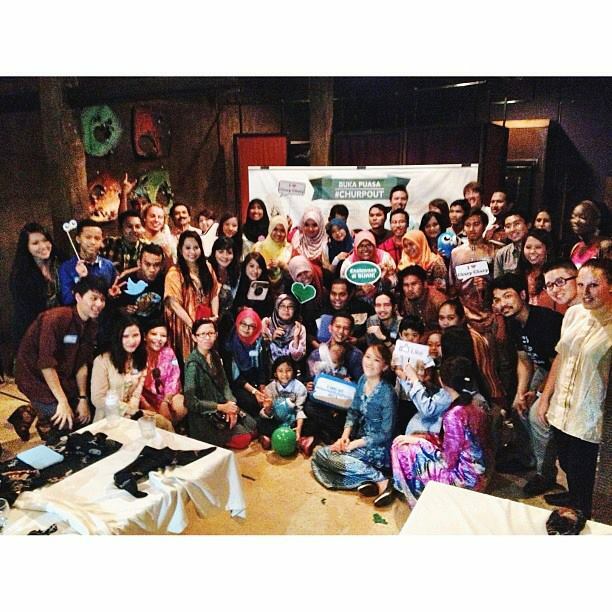 Last Saturday (27th July '13) was an awesome Iftar for me where I got an invitation from Churp2 to attend their Buka Puasa at Bijan Restaurant, KL .. Honestly, this is my first time i got invitation from Churp2 and i was so happy and excited as well..Thank You Churp2..
Alhamdulillah, we didn't get lost on our way to find this Bijan Restaurant since this is the first time for me..and i'm not stuck on the traffic jam as well, lucky me! hehehee..
we early! Fana, Kak Asyik and Me..
the decoration for this Bijan Restaurant where I can say it is exclusive decoration..
makanan yang terhidang pun sedap2!! sampai kembung perut pika..hihiii.. Thank You Churp2 for this Card Raya! my first Card Raya I received for this year..hihii..
our table full with foods! we randomly pick anything from the buffet..from the main menu until the dessert.. and put it on the table and share along together! OMG, we eating like a Caveman! HAHAHAA..
Dinner time entertainment is a performance by Clement and Kristal ..
and there also a few game where Churpers can play along with and get a special gift from Churp2!! this is my first time meeting RedMummy..among the famous blogger in Malaysia i guess..hihii.. I had a great time spending my Iftar on that day with Churp2 and my blogger friends..
sama lah dgn pika..1st time gak dengar ni..
dh mcm raya plak tgk..
yup! mmg best..sambutan meriah pulak tu..hihii..
puas hati dapat makan free..
biasanya kena bayar brape ek satu kepala? yes, puas hati la mkn free..hehehe..